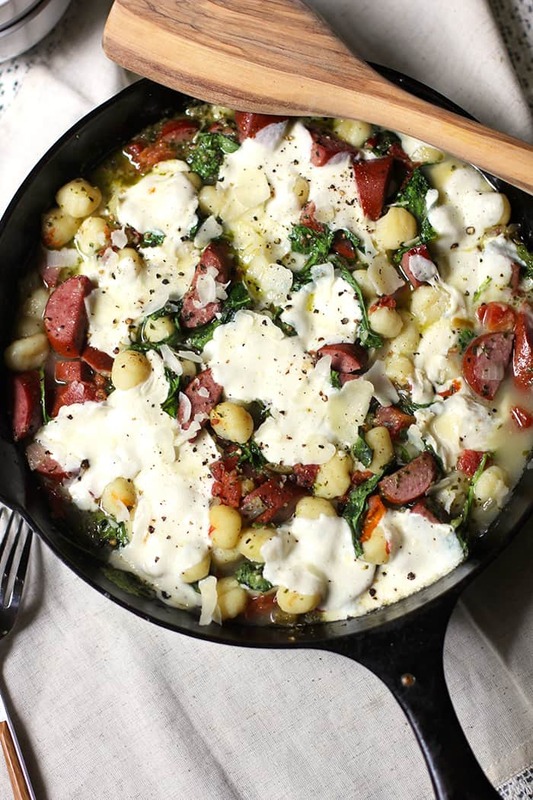 One Skillet Sausage Pesto Gnocchi (pronounced n-yawk-ee) combines Jennie-O Turkey Sausage with mini potato dumplings (gnocchi), fresh spinach, and a mixture of Rotel, pesto sauce, and chicken broth – topped with fresh mozzarella. So tasty, and a quick one-skillet meal for busy work nights. We just returned from a fabulous vacation and I’ve been digging out of all the mail, email, bills, back-to-school stuff, laundry, and other housework. I love vacationing but I dislike the catch-up it leads to afterward. Nevertheless, I’m beyond grateful for the great family time we had together. 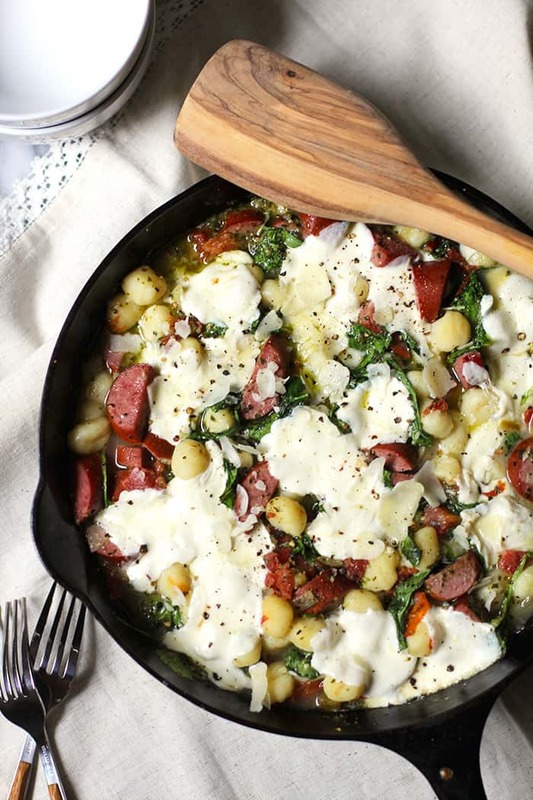 This one-skillet meal was created with many things in mind. 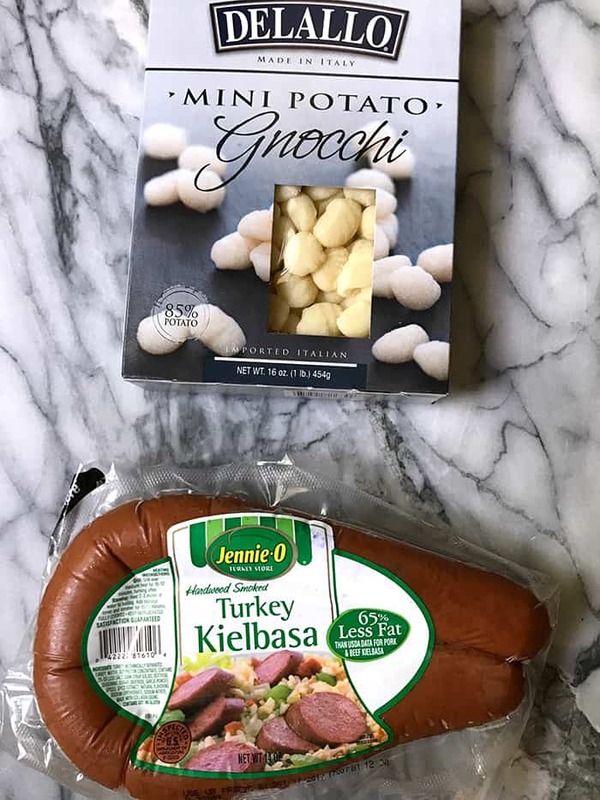 I received a box of Jennie-O product while we were gone, and so this meal uses Hardwood Smoked Turkey Kielbasa. I love Jennie-O products, and am glad to promote their products – which I’ve used for years. 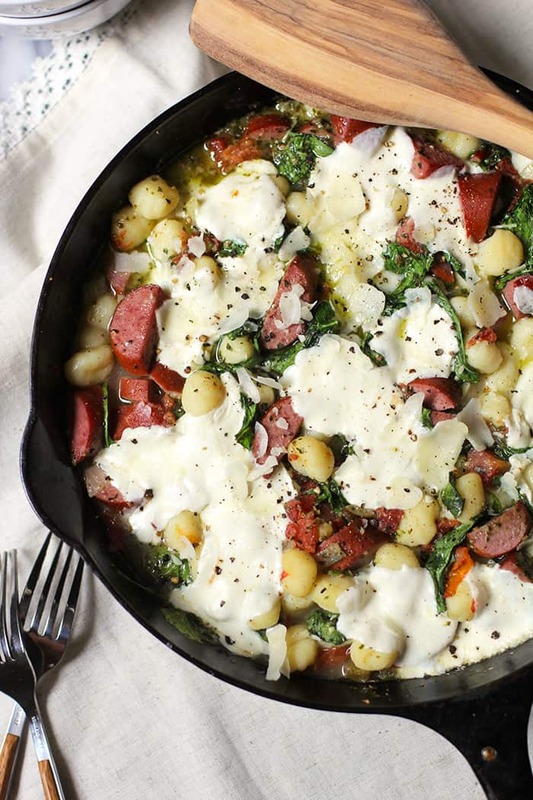 The gnocchi is something I’ve been dying to try, and I was surprised at how good it was in this skillet meal. One-skillet meals have been the trend as of late, and spending less than an hour preparing was right up my alley after being out of town. 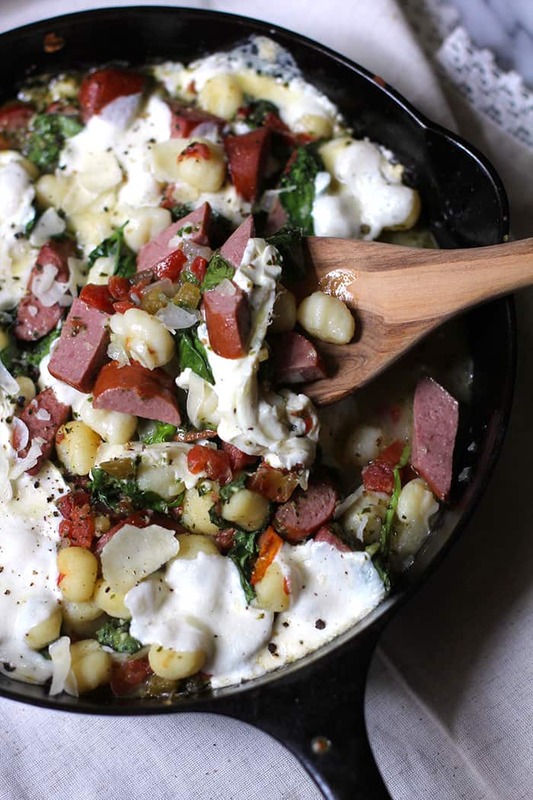 If you spend much time on Pinterest or FoodGawker, you’ve seen dishes including these mini potato gnocchi (n-yawk-ee). They are an Italian product, similar to pasta, but are made with 85% potato. The taste has a light, pillowy texture and is a great alternative to pasta. 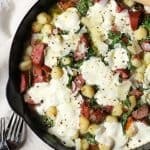 These gnocchi cooked up relatively fast, and were perfect for this One Skillet Sausage Pesto Gnocchi meal. This one-skillet meal can be varied with numerous substitutions. Use another type of Jennie-O sausage, even a crumbly one that needs browning. Add/substitute a variety of other veggies, like zucchini, summer squash, broccoli, etc. Try other types of cheese, like a regular shredded mozzarella. Use regular diced tomatoes instead of Rotel/pesto combination like I used. Use store-bought pesto sauce instead of my homemade version. The combination of Rotel and pesta sauce was a unique flavor. Spicy, garlicky, and fresh. Please let me know if you try this One Skillet Sausage Pesto Gnocchi, and how you like it! Heat cast iron skillet to medium high heat. Add olive oil and onions, and sauté until soft, approximately 4 minutes. Add garlic and stir for another 30 seconds. Remove pan from heat. Add the sliced kielbasa, gnocchi, fresh spinach and stir well. Add pesto, Rotel, chicken broth, and seasonings - and stir to make sure spinach is in liquid. Top with fresh mozzarella balls and parmesan cheese. Bake for approximately 23 - 25 minutes, or until everything is cooked through. Serve with an extra sprinkle of cheese and some fresh basil. This recipe looks great! Can’t wait to make it. Quick question: does the gnocchi need to be boiled in water before it’s baked? I am not sure how to pronounce it, but I know how to eat it! Also, love the list of ingredients and that it can be cooked in less than 45 minutes.